The idea for this article all started when I reading an article from Ed Wilson’s Hey Scripting Guy blog. 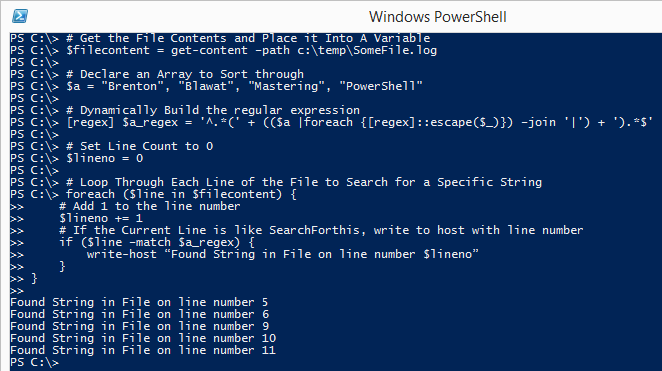 He had a guest blogger Rob Campbell who wrote an article on “Speed Up Array Comparisons in PowerShell with a Runtime Regex” (That article can be found here.). Rob mentioned that he had a situation where he needed to do multiple array comparisons, but wanted to find a more efficient way of doing it. Rob’s method was to dynamically create a regular expression to evaluate one to many, which should be faster than comparing multiple arrays using ForEach loops. While this may work well for single string evaluations, what happens if it needs to match multiple array items? In my customers instance, I had a list of 517 items I was searching for in a entire file system. To make things worse, some of these files were 38000 lines long! In the instance where no matches were made, the script would have to make 19.72 million comparisons! That’s just for one file! Take the SQL Server 2012 R2 Installation XML file named qg4m0tvx.xml, for example. It is 38819 lines long. If there were no matches in the file, the script would have to make 20.06 million comparisons before it could move on to the next file, which subsequently may be just as large. It would take almost an hour to evaluate just the media for SQL Server 2012 R2… this is where we put Rob’s suggestion to the test. When you apply Rob’s regular expression to searching, it does in fact significantly speed up the evaluations for large files. 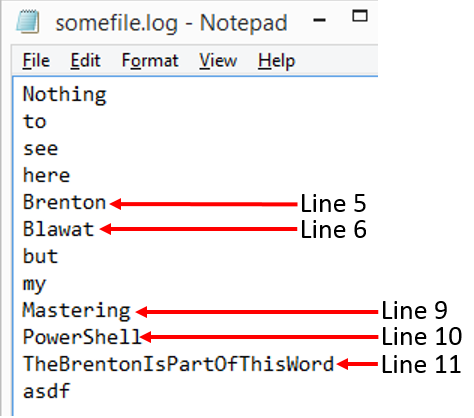 Also, (as pointed out another engineer I was working with) I determined that reading XML files line per line was senseless as PowerShell can natively read XML files. While this also slightly improved our searching, we won’t get much into the XML portions until a later blog posting. However, what we will do is re-explain Rob’s blog posting for this particular case study. Essentially, the regular expression is stating, create a regular expression and store it into a variable named $a_regex. The (?i) designates case insensitivity, however, it is not needed in this equation because PowerShell’s –match operator is case insensitive by default. You then create the beginning anchor of ^ to tell the regular expression to begin evaluations. You then declare the $a variable and pipe it to a ForEach loop. The ForEach loop will escape each “illegal” character in the array of $a, and separate each value with a | symbol. The “|” symbol in regular expressions is not a pipe like PowerShell, rather, it is telling the regular expression this OR that OR this OR ect. You Then complete the expression by declaring the end anchor $. $a = "Brenton", "Blawat", "Mastering", "PowerShell"
We found some very interesting information pertaining to the speed testing as it pertains to arrays versus regular expression comparisons. 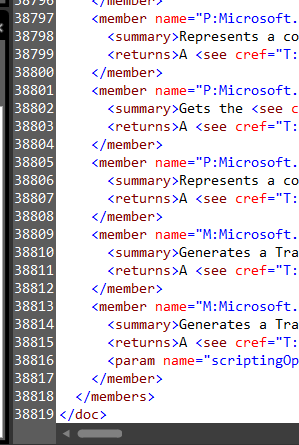 To setup the test, we had a local copy of all of the XML files from the SQL Server 2012 R2 installation media. We chose these because they contain approximately 153,838 lines of to compare results against. This means that if we were to search for 517 items (which we did) the system would be making 79.53 MILLION comparisons. Yeah… that is a lot of data. From our tests with Array based file scanning versus Regular Expression based file scanning, the regular expression file scans were on average 70% faster. 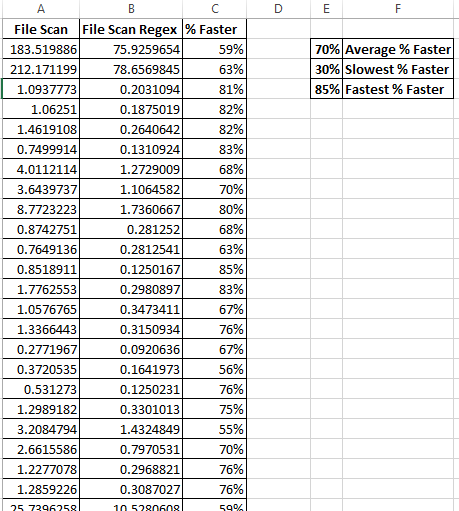 The fastest times (70-85%) were for very small files. The larger files were approximately 59% to 63% faster. There wasn’t an instance were array based evaluations were faster based on 517 comparisons per line (large comparisons). The smaller the number of comparisons (lets say we dropped the number from 517 to 15), the less efficient regular expressions became. For small comparison data sets, regular expressions may not be necessary. All pretty cool findings, and great work by Rob for posting the blog article on Hey Scripting Guy’s site! Regular expressions are definitely the way to go for large comparison or repetitive comparisons.